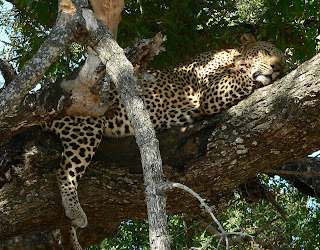 An adult male leopard full and sleeping. Even though rare, leopards have the broadest range of all the world's big cats. They live across both Africa and Asia, from deserts to high mountains, in warm and cold climates. Leopards are much more adaptable than lions. I've read that leopards can survive with only the water that's in their prey - no drinking water. Not sure if that's true, but it is true that they need very little drinking water. Their adaptability has helped them survive droughts and loss of habitat in Africa and Asia, although apparently all subspecies of leopard are listed as endangered by the IUCN (International Union for Conservation of Nature), according to Earth's Endangered Creatures. Because they are so widespread, and because there are at least nine subspecies across Africa and Asia, I couldn't find an estimate of the total number of leopards remaining just in Africa. What I know for sure is what I've seen. Spotting a leopard is different from seeing a lion or a group of lions. First of all, unlike lions, leopards are solitary. Adults meet only to mate, period. They never hunt together as lions do, even if two leopards' territories overlap. Leopards are elusive, slinky, graceful. Clever. If you see one cross the road way ahead of you, keep an eye on the road behind you. You may see him recross the road after he thinks you're gone and not paying attention. 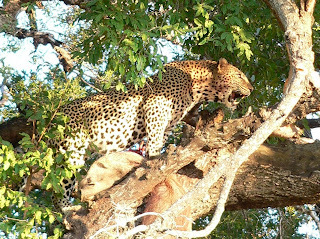 We didn't expect to see leopards on either trip to Africa, but we did, on both trips. In June this year, the first one we saw was hiding in tall grass, in the morning light. (Leopards hunt at night or early morning.) The black rosettes on his tawny fur were effective camouflage - the cat was hard to spot. But there he was, dozing, eyes shut with his head held erect. Maybe he was listening for prey, I don't know. They do eat scrub hares and sometimes rodents or even invertebrates. I say "he" because it was a big leopard, and males are much bigger than females. The big male leopard was dozing - or listening for prey - in the morning sun. Sometimes she moved down the same sandy track we were driving on (below). Sometimes she cut through the bush (below), and eventually we lost sight of her. 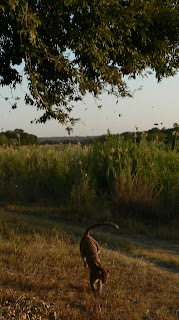 But that night, we came upon a female leopard hunting. It was a moment of electric excitement for me. She was trotting down the sand road we were slowly driving down, in front of us. We turned on the parking lights and followed her at a distance. The leopards there are accustomed to animal-viewing vehicles in the bush, they don't pay much attention as long you stay in the car. After a couple of minutes we came to a herd of impala in a dark field beside the sand road. 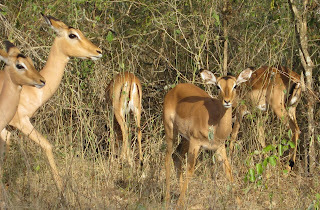 Impala are mid-sized antelope, just the right size for a leopard. Impala in the area, but not the same herd we saw that night. The leopard saw them, too, and she stopped. We turned off the parking lights and cut the engine, behind her. It was now pitch dark, and the impala didn't see her. They could smell her, though, because they started making the wheezy alarm snort they make to each another when they're freaked out, when a predator is near. 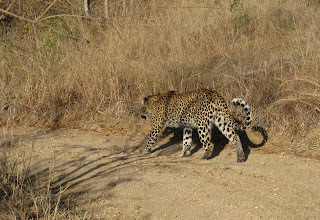 And this really shocked me: the leopard dropped to a crouch on the road, ready to pounce - right beside our vehicle! I swear she was only 5 feet from the front left tire (photo below). She was watching the impala, ready for the right moment to spring. I thanked God fervently that I was still alive to experience such a moment. I tried to just soak it in. I thought about all the hours I'd spend at my desk at work to pay for this trip!! But here I was! Yay! And then we waited. And waited. And waited. We sat for probably an hour waiting for her to decide that it was the right moment to pounce. I've read that leopards prefer a distance of 5 meters before pouncing. Anything farther than 20 meters is too far. I guess she was waiting for one of the impala to wander to within a distance of 5 - 20 meters, and maybe that never happened. I don't know. We could still hear the impala snorting the whole time, although we couldn't see them in the dark. We could only see the leopard when I turned on a tiny red light on my camera (or the one time I took a picture). Anyway, we finally gave up and left. It was well into the night and we were tired. The next morning we went back and I hoped so much we'd find her with an impala carcass up a tree. But we didn't. Maybe we just didn't see it. 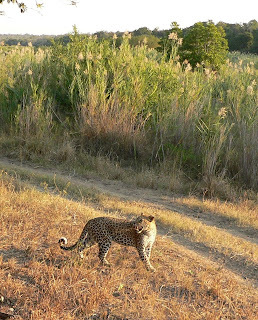 In 2007, we had a leopard experience that was even more startling. We were on a game drive in an open jeep, in a protected area not too far from the area I just described - west of the park, in Greater Kruger. Driving along a sandy dirt track in the bush, we crossed a river at a shallow spot, then driving uphill, we came upon a dead warthog hanging on a branch in a tree. Leopards typically drag their prey into trees to keep hyenas and lions from stealing their prey, neither of which can climb as high or as easily as leopards. So we stopped and waited. Within five minutes we saw an adult female leopard walking calmly out of the riverine bushes and reeds on our left toward the tree with the warthog, crossing the dirt track in front of us (below). After an awkward moment the female lept to the right onto the main branch, and made her way down the branch, away from the angry male. The male stood up and snarled at her as she lingered on the branch. In the photo above, the warthog's neck is bent to the left, hung over the smaller branch. 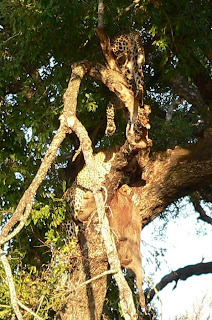 You can see his head and snout just below the leopard's belly. His body dangles below. Then the male lay down and clutched his warthog, glaring at the female (above). The smaller female gave up, walked to the end of the branch and jumped to the ground (photo above). 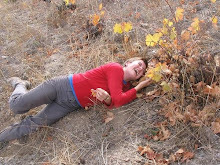 With one look back, she turned and walked slowly back into the brush along the river (above). 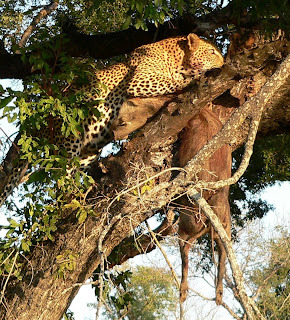 The male leopard relaxed then, lay down on the branch near his dead warthog, closed his eyes and snoozed. His belly looked full, although the warthog looked intact. I guess he was saving it for later. I don't imagine I'll ever see another wildlife sight as dramatic as that, unless I see a predator actually make a kill. Maybe one of these days. But I do thank God that I am alive in a time when these incredibly inspiring animals still walk the Earth. I don't know how much longer that'll be. What if I was born 100 years from now instead? Or 50 years from now? Would they still be here? What are the threats to leopards? The biggest threat is habitat loss for their prey animals, due to human population growth and human activities such as agriculture, raising livestock, mining, etc. Then there's the biggie that will ultimately alter all habitats: climate change. Like lions, leopards are popular with trophy hunters too, on "canned" hunts. Just click google images for "leopard trophy hunt Africa" and take a look at the photos of "trophies" (guys with rifles holding dead leopards) and ads for canned hunts. In some areas farmers try to exterminate leopards to protect their livestock, with snares, traps, or poison. Kermit the Frog said "It's not easy bein' green," but how about this: It's not easy being a big cat in Africa. In sub-Saharan Africa, nearly every country has an agrarian economy, and livestock play a big part in that. Cats can be the enemy. They do eat livestock if they can't find their natural prey. So, as I said with lions, solutions must include reimbursing farmers and herders for livestock lost. Solutions can include community groups that take turns watching for predators. And hopefully, solutions will include grass-roots tourism. Helping local people transition from livelihoods that destroy, overgraze, and otherwise degrade habitat to livelihoods that depend on keeping habitats and wildlife alive and intact. Americans, Europeans, and Asians bring billions of dollars into Africa every year, looking for wildlife to photograph. 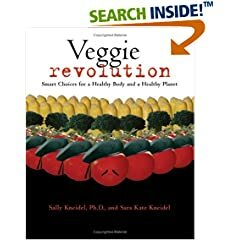 What if all of that went into the hands of local people who would otherwise be raising livestock to feed their family? What if? If you go to Africa, or any destination that's a wildlife hotspot, find out where your dollars are really going. If you need help, leave a comment after this post and I'll respond. From home, you can join conservation organizations that protect big cats and their prey. You can encourage stores not to carry fur coats; encourage people not to buy or wear fur. 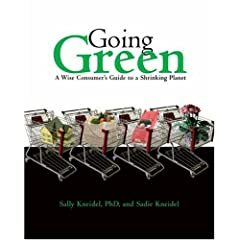 You can also do what you can to reduce the human impact on the environment. The actions of people in industrialized nations profoundly affect people and wildlife in developing nations all around the world. South Africa: Limpopo Leopards in Danger. African Conservation Foundation.